Fritz Scholder was born in Breckenridge, Minnesota in 1937 to parents that worked in pottery and in school administration for the Bureau of Indian Affairs. Fritz Scholder’s paternal grandmother was a member of the Luiseño tribe of California’s Mission Indians. Thus, he was one-quarter Indian and did not identify as an Indian. He was raised in Wahpeton, North Dakota, South Dakota and Wisconsin, attending public schools with primarily Anglo children. His first American Indian instructor was Oscar Howe at a high school in Pierre, South Dakota, who introduced him to modern art. In the 1950s, Scholder and his family moved to California, studying at Sacramento City College with Wayne Thiebaud, a pop artist. Thiebaud presented him with early opportunities to showcase his work. Scholder’s first show was in 1961 in Sacramento, which received excellent reviews. Scholder’s style was that of bold colors and generous brushstrokes. After graduating with an MFA Degree in 1964, Scholder became an instructor at the newly formed Institute of American Indians Arts in Santa Fe, New Mexico, remaining there for five years. In 1967 he began creating a series that maintained his bold, contemporary style that combined Abstract Expressionism and Pop Art, while introducing depictions of the contemporary lifestyle of American Indians. With humor, he presented such clichés, and he drew attention to the issues of self-alienation and the enforced alienation of these citizens. He resigned from teaching in 1969 and travelled to Basel and Egypt before settling in Scottsdale, Arizona. He then moved into the American Portrait series. He also pursued tactile sculpture, which merged his experience of the medium in graduate school with his imagination. The American Portrait series and sculptural works were inspired by his collection of Egyptian artifacts that he lived with, along with a desire to imbue his work with more of his self. Scholder’s Indian series continued to garner attention while his newer series were being explored. 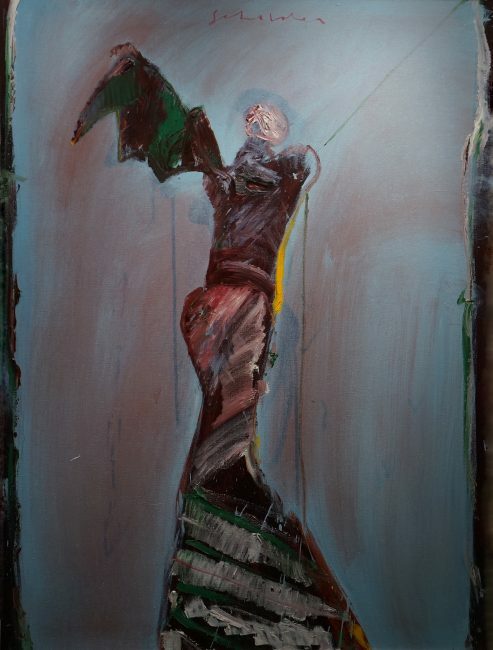 In 1972 a two-person show with a former student, Two American Painters: Fritz Scholder and T.C. Cannon, opened at the American Museum of Art of the Smithsonian Institution, Washington D.C. to good reviews and it traveled to Romania, Yugoslavia, Berlin and London. He began the American Portrait by 1980 and the Flower series in 1979, inspired by his surroundings and the challenge of pursuing non-figural subject and in a beautiful manner. His work was shown at the Basel International Art Fair in 1974, The Tucson Museum of art for a 1981 retrospective, and the Phoenix Art Museum in 1997 for his beastly artworks. In addition three documentaries were produced on the artist, in 1977, 1997, and 2008, the former two made by PBS. Following his death in 2005, an important exhibition was held in 2008 at the National Museum of the American Indian, Washington D.C. and New York, called “Fritz Scholder: Indian/Not Indian,” which placed many of his artworks from private collections on public view. Today Scholder’s works are in the collections of: Museum of Modern Art; Brooklyn Museum of Art; Art Gallery of Toronto; Bibliotheque Nationale, Paris; Center Cultural American, Paris; Los Angeles County Museum, California; San Francisco Museum of Art; National Collection of Fine Arts; and the Houston Museum of Fine Arts.